Dinner last night saw most of us attack the carvery – it was Sunday after all: roast gammon and beef never tasted so good! 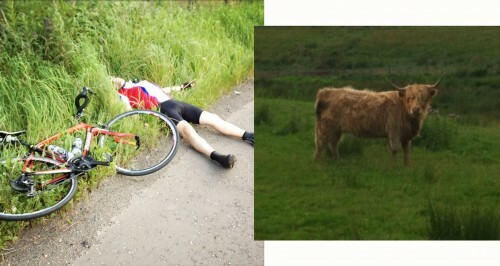 Post-dinner debates concluded that time trialling was probably not compatible with a JOGLE ride. As the Olympics are now over and 926 miles is quite a long way, I’m thinking this is probably quite sensible! An 8.30 start this morning and changeable weather. Michael Fish-Griffiths normally forecasts this, as a safe option, but today he was right. We kept fairly dry, but the wind today was a killer, and more often than not came straight at you. Combine this with the worst road surfaces of the trip so far, and bleak, desolate landscapes and you get an idea of the scale of today’s challenge. The first 20 miles were a welcome relief from yesterday’s frenetic pace. Cycle paths running along the old railway line, and then alongside the canal brought us slowly into Glasgow. We then fought our way through the city streets and to the harbour. Constant stopping and starting was frustrating and time consuming, but there was no shortage of sights, particularly around the docks. Simon kept us amused with a comedy fall at the traffic lights, a bit like the one described yesterday. One minute he was beside me, the next I heard a muffled whimper and watched him crash onto the street. I don’t think much else than pride was hurt but it was very funny and something of a tonic for seven guys seriously beginning to struggle with the stresses and strains of 300-plus miles under the belt. The fall must have shaken him as later in the day he was clearly exhausted, as this photo shows. 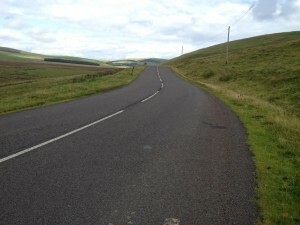 After the stops and starts of Glasgow, we hit open countryside again and picked the pace up. Over 50 or so miles we experienced, once again, the contrasts of beauty and bleakness that sum up the Scottish countryside. Sorry, did I forget to mention recently that we’re still in Scotland? So day 4 is done, and it has been one of our hardest: this was a long and tiring section that saw us finish late at 7pm. Everyone is beginning to feel it, even Lewis. Bodies are seriously aching, we’re dealing with cramp and strains and I’m on the hunt for a double knee transplant. For continuity (more tomorrow) we’re staying at the Premier Inn Dumfries tonight, I think we’ll all be in bed early. Forecast is wet tomorrow (joy) and there’s a rumour we might be crossing the border (deep joy!). Labrador – asleep or not well? Print article This entry was posted by admin on August 21, 2012 at 8:52 am, and is filed under 2012 ride. Follow any responses to this post through RSS 2.0. You can leave a response or trackback from your own site.